After the marriage ended she returned to England, with three chapters of the first Harry Potter book complete. J. K. Rowling was financially poor for a time, living on welfare. It was during this time that she completed the manuscript for the first Harry Potter book. 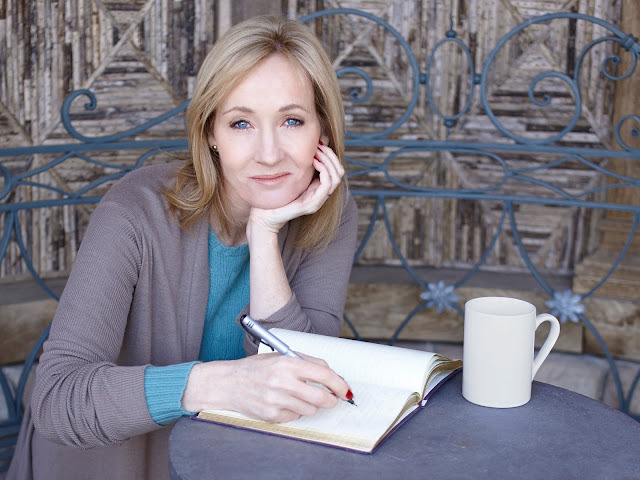 J. K. Rowling did not publish under her name Joanne Rowling because the publisher thought boys might not buy a book written by a woman. Her name was shortened to J. and the K. was added even though she had no middle name. The letter K was chosen because Joanne's grandmother's name was Kathleen. The second book, Harry Potter and the Chamber of Secrets became No. 1 in adult hardcovers within 30 days of publication in July 1998. In July 1999 Harry Potter and the Prisoner of Azkaban was published and became a bestseller as quickly as the second book had the year before. The Harry Potter series continued with Harry Potter and the Goblet of Fire (2000), Harry Potter and the Order of the Phoenix (2003), Harry Potter and the Half-Blood Prince (2005), and Harry Potter and the Deathly Hollows (2007). J. K. Rowling wrote two more Harry Potter volumes titled Quidditch Through the Ages, and Fantastic Beasts and Where to Find Them. The proceeds went to Comic Relief after being published in 2001. Because of J. K. Rowling's contribution to children's literature she has won several awards including the Prince of Asturias Award for Concord, the Hans Christian Anderson Literature Award, and France's Légion d'Honneur. J. K. Rowling published an adult novel titled The Casual Vacancy in 2012. J. K. Rowling writes under a pseudonym Robert Galbraith. The first book was a crime novel titled The Cuckoo's Calling (2013). A second crime novel under her pseudonym is in the works. In 2001 J. K. Rowling married Neil Murray. She has two daughters and one son. J. K. Rowling established the Volant Charitable Trust in 2000. It has a budget of 5.1 million pounds and is meant to help combat child poverty as well as social inequality. J. K. Rowling has received several honorary degrees from several universities including Harvard University, the University of Edinburgh, the University of Aberdeen, and St. Andrews University. For a brief period J. K. Rowling taught English in Portugal. There she met her first husband, and had a child. J. K. Rowling's net worth is estimated at more than $1 billion, with the majority of her money coming from the Harry Potter series and movies.